Galaxies are collections of billons of stars; our home galaxy, the Milky Way, is a typical example. Stars, gas, and interstellar dust orbit the center of the galaxy due to the gravitational attraction of all the other stars. New generations of stars are born out of gas that condenses within regions called giant molecular clouds, and the stars sometimes form into star clusters. When a star reaches the end of its evolution, it may return much of its gas back to the interstellar medium, which will be the source for a new generation of stars. Galaxies can be thought of as systems that turn gas into stars and back again. When we look at a galaxy, the light we see comes from two sources. First, we see light from its billions of stars; since most galaxies are so far away, we don't see individual stars - just the combined diffuse light of all. Second, we see fluorescent light emitted by gas ionized by hot, luminous stars. These glowing gas clouds mark the sites of newly born stars - they often look like beads stringing the arms of spiral galaxies. The light from both stars and gas is dimmed to some extent by dust within the galaxy's interstellar medium. Compared to the Solar System, galaxies are huge. Traveling at the speed of light, it would take about two seconds to go from the Earth to the Moon, and about 5 1/2 hours to go from the Sun to Pluto. It would take 25,000 years to go from the center of the Milky Way to the Sun's position. The Milky Way has more than a hundred billion stars, but the stars are so far apart that they almost never collide. Even close passes of two stars are highly unusual. Since stars rarely interact with one another, their orbits around the galaxy rarely change. Stars' orbits reflect the motion of the gas out of which the stars formed. Therefore, the shape of a galaxy tells us about the conditions in which it formed - unless the galaxy has suffered a collision. While stars within a galaxy are separated by very large distances compared to their sizes, galaxies are separated from their nearest neighbors by distances that are much smaller when compared with galaxy sizes. Thus, collisions between galaxies as they move through intergalactic space are not uncommon. When galaxies collide they interpenetrate - the stars slip through - but gas clouds in one galaxy are compressed and slowed down by gas clouds in the other. The orbits of stars may be substantially perturbed (because of the gravitational force that one galaxy exerts on the other), and the compression of the gas clouds might stimulate them to collapse and form stars at an especially high rate. Because stars in galaxies are so far apart, a patch of a galaxy is usually very dim. From your back yard, you have difficulty seeing any galaxies at all with the unaided eye, even the closest. 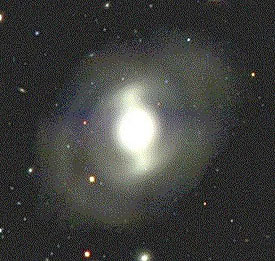 However, SDSS maps show galaxies in profusion, about as many galaxies as stars. 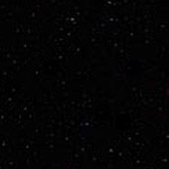 Stars appear as small dots (bright stars have a cross structure that is an artifact of the telescope). The larger, brighter galaxies are easy to identify: they are patches of light with a rich range of forms, from ellipticals to spirals. The much more numerous, fainter galaxies are harder to find. Look for images that are fuzzier and lower-contrast than the point-like stars. Many different types of galaxies exist. The different types of galaxies not only appear different, but have different evolutionary histories as well. The three fundamental classes of galaxies are elliptical, spiral, and irregular. These categories are further broken down into subclasses, often illustrated using a Hubble tuning fork diagram. Originally, scientists thought this diagram may have represented an evolutionary sequence for galaxies, but today we know that this is not true. The formation and evolution of galaxies is a complex process that is poorly understood. Elliptical galaxies are so named because they have elliptical shapes: they look like fat, fuzzy eggs or footballs. Stars in ellipticals do not spread out into a thin disk, as they do in spiral galaxies; instead, they wrap evenly around the galaxy's center in all directions. Ellipticals have smoothly varying brightnesses, with the degree of brightness steadily decreasing outward from the center. If you look at an ellipse-shaped surface that surrounds the center of an elliptical, all the stars on that surface will have similar brightnesses. Elliptical galaxies are also nearly all the same color: somewhat redder than the Sun. On the tuning fork diagram, they are classified as E, followed by a number indicating how elliptical a given galaxy is. The higher the number, the more elliptical the galaxy; that is, the longer the galaxy is with respect to its width. The reddish color of ellipticals (as well as other more detailed observations) tells us something important their histories. The galaxies' red color comes from older, cooler stars. The fact that most of the light comes from old stars suggests that most ellipticals formed long ago. The fact that the color of an elliptical is more or less the same throughout the galaxy suggests that most of the stars in these galaxies formed at about the same time. In addition, most elliptical galaxies in the universe are found near other elliptical galaxies, in galaxy clusters. In these clusters, some 75% of the galaxies are elliptical. This clustering also suggests that they formed a long time ago, because galaxies are likely to have formed first in high-density regions like galaxy clusters. The largest galaxies in the universe are giant elliptical galaxies. They can contain a trillion stars or more, and span as much as two million light-years - about 20 times the width of the Milky Way. Some of them appear to contain supermassive black holes at their hearts - star-gobbling monsters that are as much as three billion times as heavy as the Sun. These giant ellipticals are often found in the hearts of galaxy clusters. Spiral galaxies like the one to the left have flat disks of stars with bright bulges called nuclei in their centers. Spiral arms wrap around these bulges. An extended spherical halo of stars envelops the nuclei and arms. Spiral arms probably form as the result of waves that sweep through the galactic disk. Like the waves on the ocean, these so-called "density waves" don't carry any material with them - they move by disrupting the material they pass through. In the case of galaxies, density waves squeeze clouds of interstellar gas, causing new stars to form inside the clouds. Some newborn stars are massive, hot, and bright, so they make the spiral arms appear bright. These massive stars are blue or white, so the spiral arms look blue-white, too. 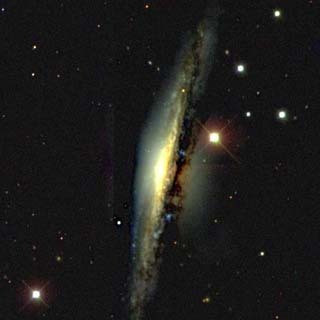 When viewed edge-on, the spiral arms often appear as dark lanes, because they contain lots of interstellar dust that blocks the light from the bulge. The gaps between the arms contain older stars, which are not as bright. However, the bulges of spirals are often red, like elliptical galaxies, suggesting that they are composed of older stars. In some spirals, the density wave organizes the stars in the center into a bar. The arms of barred spiral galaxies spiral outward from the ends of the bar. The Milky Way may fall into this class of spirals, called barred spirals. In the Hubble tuning fork system, normal spirals are designated "S" and the barred varieties "SB." Each of these classes is subclassified into three types according to the size of the nucleus and the degree to which the spiral arms are coiled. The three subclasses are denoted with the lowercase letters "a," "b," and "c." Some galaxies are also intermediate between ellipticals and spirals. 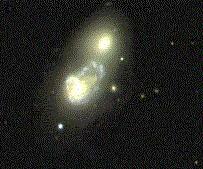 These intermediate galaxies have the disk shape characteristic of spirals, but have no spiral arms. These intermediate forms bear the designation "S0." 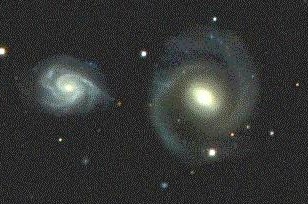 Three spiral galaxies are shown below. The final class of galaxies, "irregulars," contains a hodge-podge of shapes - anything that looks neither spiral nor elliptical. Any galaxy with no identifiable form - whose stars, gas, and dust are spread randomly - is classified as irregular. Irregulars are the smallest galaxies, and they may contain as few as one million stars. They may be the "building blocks" that came together to form the first large galaxies. Many small irregular galaxies orbit the Milky Way, including the Large and Small Magellanic Clouds. Hubble recognized two types of irregular galaxies, Irr I and Irr II. Irr I is the most common type of irregular galaxy. This type and seems to be an extension of the spiral classes, beyond Sc, into galaxies with no discernible spiral structure. Irr I galaxies are blue, highly resolved, and have little or no nucleus. Irr II galaxies are rare. 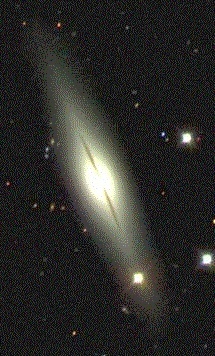 This type includes various kinds of chaotic galaxies, which appear to have formed in many different ways. 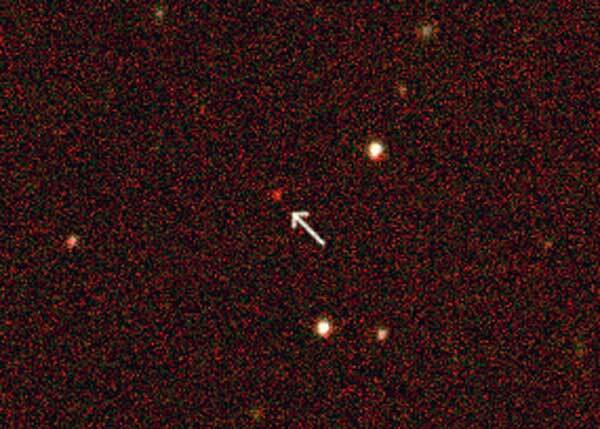 Quasars were first discovered in the early 1960s when radio astronomers identified a small star designated 3C 48 that emitted powerful radio waves. When they measured the spectrum of the star, they found something completely unexpected: the spectrum was flat with several unexpected, and totally unexplainable, emission lines. The object remained a mystery until similar but brighter object, 3C 273, was discovered in 1963. Astronomers noticed that 3C 273 had a normal spectrum with the same emission lines as observed in radio galaxies, but the spectrum had been greatly redshifted (that is, spectral lines were found at longer wavelengths than expected). This observation explained the mystery of 3C 48's spectrum: it was an ordinary spectrum from a radio galaxy, but it was so redshifted that familiar spectral lines were so far from where they should have been that no one recognized them. When an object moves away from us, its spectral lines are redshifted; the faster it moves, the greater the redshift. If 3C 273's redshift were to be due to its velocity, however, its velocity would have to be faster than the speed of light - which is impossible. Many more such objects were found, and they came to be known as quasi-stellar radio sources, abbreviated as quasars. Today, we know that quasars are galaxies with extremely energetic nuclei. The amount of radiation emitted by such a nucleus overwhelms the light from the rest of the galaxy, so that only special observational techniques can reveal the rest of the galaxy's existence. The nucleus explains why quasars appear starlike - all we can see is the bright central engine. Although the nucleus of a quasar is extremely small - only the size of the Solar System - it emits up to 100 times as much radiation as an entire galaxy. The galaxy underlying the brilliant image of a quasar is probably fairly normal, except for the superficial large-scale effects of the quasar at its center. Quasars are thought to be powered by supermassive black holes at the centers of galaxies. The powerful radiation we see comes from matter swirling around and falling into the black hole. The SDSS (and sky surveys that use visible light) can find distant quasars at redshifts of 4-6, or 90% as old as the universe itself, because quasars look like stars but have peculiar colors. By searching for faint starlike objects and taking their spectra, the SDSS is expected to find thousands of quasars at redshifts greater than 4. 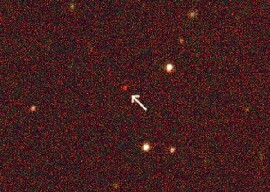 The most distant quasar yet discovered, at a redshift of 6.4, was seen by the SDSS in January 2003.